Figure 1. Treatment of Hep G2 cells with H2O2 stimulates phosphorylation of ACC at Ser79, detected by the PathScan® Phospho-ACC (Ser79) Sandwich ELISA Kit #7986, but does not affect the levels of total ACC detected by PathScan® Total ACC Sandwich ELISA Kit #7996. Hep G2 cells (80-90% confluent) were treated 10 mM hydrogen peroxide for 10 minutes and lysed with #7018. The absorbance readings at 450 nm are shown in the top figure, while the corresponding western blots using Acetyl-CoA Carboxylase (C83B10) Rabbit mAb #3676 (left panel) or Phospho-Acetyl-CoA Carboxylase (Ser79) Antibody #3661 (right panel) are shown in the bottom figure. Figure 2. 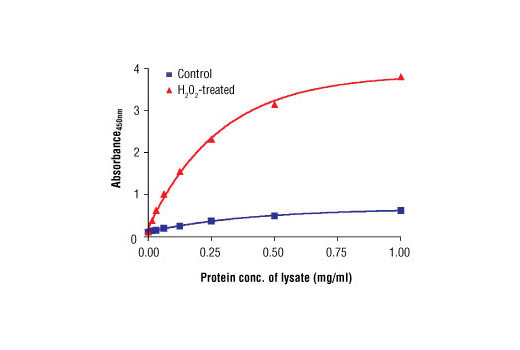 The relationship between the protein concentration of lysates from untreated and H2O2-treated Hep G2 cells and the absorbance at 450 nm using the PathScan® Phospho-Acetyl-CoA Carboxylase (Ser79) Sandwich ELISA Kit is shown. Cell Lysis Buffer: PathScan® Sandwich ELISA Lysis Buffer (1X) #7018: This buffer can be stored at 4°C for short-term use (1–2 weeks). Recommended: Add 1 mM phenylmethylsulfonyl fluoride (PMSF) immediately before use. Remove PBS and add 0.5 ml to 1 ml ice-cold PathScan® Sandwich ELISA Lysis Buffer (1X) #7018 plus 1 mM PMSF to each plate (10 cm diameter) and incubate the plate on ice for 2 min. Collect cell lysate in a clean tube. Centrifuge for 10 min (14,000 x g) at 4°C and transfer the supernatant to a new tube. Store supernatant at -80°C in single-use aliquots. Resuspend the cell pellet and incubate the tube on ice for 2 min. Add 100 μl of each undiluted or diluted cell lysate to the appropriate well. Seal with tape and press firmly onto top of microwells. Incubate the plate for 2 hr at 37°C. Alternatively, the plate can be incubated overnight at 4°C. Wash 4 times with 1X Wash Buffer, 200 μl each time for each well. Add 100 μl of reconstituted Detection Antibody (green color) to each well (refer to Section A, Step 2). Seal with tape and incubate the plate at 37°C for 1 hr. Add 100 μl of reconstituted HRP-Linked secondary antibody (red color) to each well (refer to Section A, Step 3). Seal with tape and incubate the plate for 30 min at 37°C. Add 100 μl of TMB Substrate to each well. Seal with tape and incubate the plate for 10 min at 37°C or 30 min at 25°C. Add 100 μl of STOP Solution to each well. Shake gently for a few seconds. The PathScan® Phospho-Acetyl-CoA Carboxylase (Ser79) Sandwich ELISA Kit is a solid phase sandwich enzyme-linked immunosorbent assay (ELISA) that detects endogenous levels of acetyl-CoA carboxylase (ACC) when phosphorylated at Ser79. A phospho-ACC (Ser79) rabbit antibody has been coated onto the microwells. After incubation with cell lysates, phospho-ACC protein is captured by the coated antibody. Following extensive washing, an ACC mouse detection mAb is added to detect the captured ACC protein. Anti-mouse IgG, HRP-linked antibody is then used to recognize the bound detection antibody. HRP substrate, TMB, is added to develop color. The magnitude of the absorbance for the developed color is proportional to the quantity of ACC phosphorylated at Ser79. 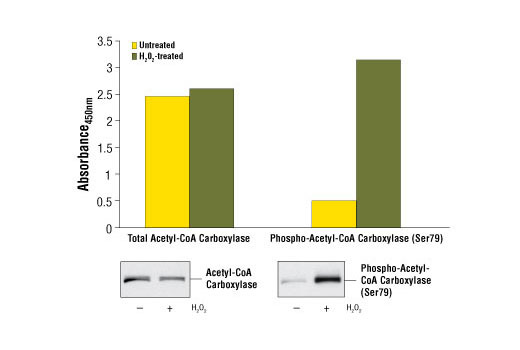 PathScan® Phospho-Acetyl-CoA Carboxylase (Ser79) Sandwich ELISA Kit detects endogenous levels of ACC protein when phosphorylated at Ser79 as shown in Figure 1. Kit sensitivity is shown in Figure 2. This kit detects proteins from the indicated species, as determined through in-house testing, but may also detect homologous proteins from other species.